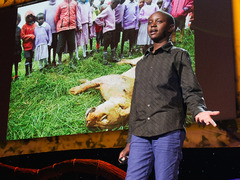 Richard Turere, 13, grew up hating lions. In Nairobi National Park, where he lives, lions roam freely and often targeted his family’s livestock at night. And yet Turere also hated the only solution his community had come up with to stop lion attacks on cows — killing the majestic creatures. 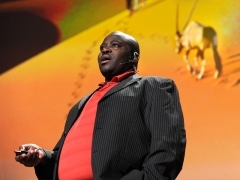 Richard Turere: My invention that made peace with lions “I had to find a way of solving this problem,” says Turere in today’s talk, filmed at TED2013. First, Turere tried using fire and scarecrows, but both failed to scare off lions for the long-haul. So electronics-tinkerer Turere had another idea. He combined these items with a light switch, a torch from a broken flashlight and solar powering. Together, they made a blinking device that flashes in unpredictable patterns, emulating a person walking with a flashlight. The device works wonders for keeping lions away. “I set this up in my home two years ago and since then we have never experienced any problem with the lions,” says Turere, adding that he has now made devices for seven families in his community and taught friends to build them too. Turere boarded his very first airplane to come to TED2013. And on stage he shared with Chris Anderson the next device he’d like to build to keep lions away — his version of an electric fence. Young Turere may be on to something. In an article in today’s The New York Times, the director of the Lion Research Center at the University of Minnesota says that, after 35 years of research, he sees fences as the most promising way to save the dwindling lion population, keeping them away from both livestock and people. Turere’s device has helped him make peace with lions. Here, watch three more TED Talks that give unexpected looks at these oversized cats. In this talk from TED2010, conservationist John Kasaona shares a wild idea his community had for conserving their local lion population: pay poachers, who know the bush and animal behavior incredibly well, to look out for the beautiful cats. And this approach is working. In 1995, there were 20 lions in Northwest Namibia. Today, there are more than 130. “Our lives have basically been like a super-long episode of ‘CSI,’” says documentary filmmaker Dereck Joubert, who has spent 28 years following leopards and lions along with his partner, Beverly Joubert. And while, yes, these cats are killers — they also have incredible personalities. 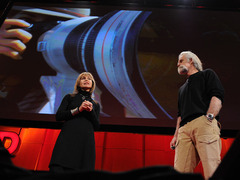 In this talk from TEDWomen, the pair shares amazing footage that humanizes lions. What do lions have to do with medical data visualization? 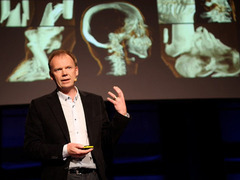 In this talk from TEDxGöteborg, Anders Ynnerman shares how scientists parse the reams of data that medical scans produce for each patient. In it, he reveals how and why they took CAT scans of a lion from a local zoo. “I think this is a great application for the future of this technology because there’s very little known about the animal anatomy,” he explains. Not that is innovative. Love it.